Warranted for 250,000 miles, the Fitch Fuel Catalyst reformulates gasoline, Ethanol fuels or 2 stroke mixtures into a superior quality fuel, allowing your recreational vehicle engine to extract the maximum horsepower, torque and efficiency. NOTE: Aggressive competitors who run fuel below 1/8 tank of fuel should pre-treat fuel in can and pour treated fuel in machine instead of dropping the unit into the fuel tank or use the F5S. The F5T-1 is recommended for smaller engines found on mopeds or scooters that generate a maximum of 25 hp with gas tanks of 5 gallons or less. "After installing the Fitch Fuel Catalyst we picked up almost 3 mpg and there were other benefits such as reduced emissions, more power. Also with the Fitch there is no more need for stabilizers in Jeeps that are stored for part of the year. "...using a fuel-injected TC88B (Heritage Softail Springer). Initially our test bike averaged about 38 mpg without the pellets. After running through a couple tanks with the Fitch Fuel Catalyst, the Heritage's fuel economy rose to nearly 42 mpg "
"...our friend Sam Martin (owner of Mount Up Cycles in Ether, NC) sent us word recounting his experience using Fitch with his '72 Shovelhead engine. Sam's engine has a 94-inch stroker kit with a Thunder jet on an S & S "B" carb. The Fitch Fuel pellets allowed Sam to drop the S & S carb's jetting from 82 down to 80 main, and he lowered the primary (pilot) jet from 35 to 31." 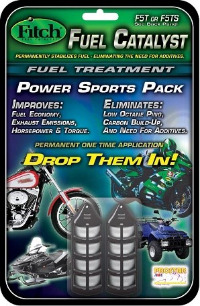 "If all this sounds too good to be true, we found the greatest advantage of the Fitch Fuel Catalyst to be its ability to stabilize fuel"
"Our most recent experience with the Fitch fuel treatment was with our 88 cubic inch Shovelhead engine that Kinetic Engines built for our '81 Rubber Glide FLT. Simply by adding Fitch to the stew, we gained two horsepower at the rear wheel, improving from 77.6 to 79.6 at 5,600 rpm. " "...I do know that the fuel problem that I was having cleared up after a tank of fuel and my gas mileage has improved since the installation of the Fitch.....Where else can you find that kind of horsepower, torque and fuel economy for that kind of money?" "We're impressed with our experience with the Fitch Fuel Catalyst. On a good warm day air cooled four strokes used to ping when loaded hard. The Fitch really makes a difference. They run clean and don't ping at all. "My bike is running just that much better with a Fitch Fuel Catalyst, supplied by PM Cycles Ltd. in Nova Scotia, just love that extra mileage! "I purchased a used Venture Royale several months ago in anticipation of a long anticipated cross country trip. When first riding my Venture, I was getting around 40 miles per gallon driving mostly 55 or a little under. I put in a Fitch Fuel Catalyst and after about 400 miles, rechecked my mileage and was consistently getting 50 miles per gallon at the same speeds. Before leaving for my "Big Trip," my brother and I rode to Bike week at Myrtle Beach, South Carolina and I had him put Fitch in his Yamaha 650 V Star. His normal mileage was 50 or so, but after driving to the Beach and around locally for a week, he got 60 miles per gallon coming home. We have both put Fitch in our SUVs, and have noticed an improvement, but not as dramatic as the bikes. Here we noticed 5% improvement both in and out of town driving. I do not care what the Rags are telling you, our cars and bikes think this stuff helps and I am not going to tell them otherwise. See more reviews like this at the Road & Rider Motorcycle Riders Forum Please direct any questions, comments, feedback or submissions to: info@roadandrider.com"
"I've been using the Fitch Catalyst in both my Harley and Bass Boat for several years now and the benefits are incredible. First with the Harley its a 1992 FXR and I have had the Fitch system in it for 6 or 7 years. It has improved my performance and fuel mileage of the bike. The boat was a Ranger R72 Bass Boat and its been about the same time frame for it. Now with the New Ranger 2013 Z119 I have also added the Fitch system to it and again better fuel mileage and performance. The most important thing with both the bike and boat is this time of year. As winter approaches and most of us that have boats, bikes or other water craft have to start thinking about winter storage its several hundred dollars to get these things winterized. Well with the Fitch Catalyst System you do not have to worry about using stabile in the fuel system. Simply store your boat, bike or whatever and it will be fine come spring time. I've done this for years now and never had a problem thanks to Fitch. I would highly recommend there products to anyone who has to store there toys for the winter. For once a company has put out a product that does what they say it can do!" "A 2000 V92C with turn-out exhaust and chip, no other modifications. Stock baseline after T.P.S. adjustment then with no other changes except Fitch Fuel Catalyst dropped into gas tank. $50 worth of drop in power that lasts for thousands of miles." "2001 M2L Buell which resulted in a 3.5 HP gain with Fitch. Having the newly treated Fitch fuel also allowed us to adjust the carburetors to tweak another 3.4 HP for a total of 6.9 HP."